You know what's been missing from this blog recently? Anything at all personal, or actually about my life in the here and now. Well, that's not entirely accurate. Everything I write is personal really, in the sense it's important to me and draws heavily on my personal experiences and background. 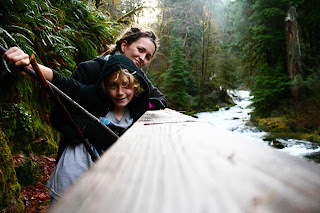 But often, writing all the posts about unschooling that I do, as much as they draw on my life, I feel like there's a distance between where I am in my life and what's happening as I write the post, and the post itself. So I decided that today felt like a good time to write about what's been happening in my life, how I've been doing, and all that jazz. Considering it's been a long time since I wrote about my life at all, I feel like there's a lot of catching up to do. Since the fall, when I did a ton of stuff, and then just came home to cold weather and not much of a local community, I haven't exactly felt at my best. Well, okay, I'm trying to be honest here: I've been downright depressed, on and off. No, not clinical depression, but the kind where you're miserable, have no motivation to do anything, feel drained by being constantly cold (I don't do well in cold weather), and find being around people too frustrating to bother doing. Top that off with some seriously self-hating feelings and stress caused by external events, and it's really not fun (I want to make it clear that I haven't been feeling constantly horrible since the fall. Just that I've been dealing with all this since the fall, to a greater or lesser extent depending on the time). What external events, you ask? Well, a couple of them are other peoples business, or too private to share details publicly online, but suffice it to say there were days of hospital visits while my father was sick and in the hospital (he's better now). Worrying about and trying to help a friend, and really wonderful person, whose life has been going to hell. And a repeat of the whole thing I went through when turning both 18 and 19 (birthdays tend to be a little rough for me), now that I'm rapidly approaching my 20th Birthday (it's on March 16th). I feel like THIS, now, as I leave my teen years, is when people are going to expect me to "be an adult" even more than ever. I start obsessing about the fact I'm not earning money right now, and start thinking that everyone must secretly think I'm a failure because of it, even if they pretend not to (yes, I realize this is neither rational nor true). Birthdays are rough. Or, at least, the time leading up to them is. Because this year, I've decided to do something different. This year, for my 20th birthday, I'm renting a house, apartment, or similar place for a week, and hosting a gathering! Some really great friends are coming, and I'm SO looking forward to it (though there's definitely still stress attached to organizing it... What if hardly anyone ends up being able to come? What if people don't enjoy it? And even worse, what if I don't find a good place to rent? Yes, that's right, I haven't found a good place yet [if you have ideas/a place you know of, please contact me!]). I can get sucked into thinking about things in a negative way really, really easily. 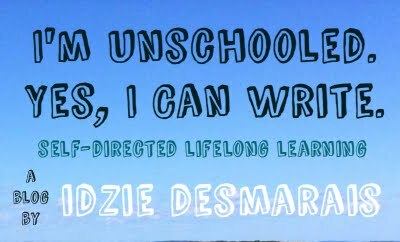 I'm also writing an unschooling zine! Like, not an ezine, but an actual, hold in your hands zine, that I'm going to be selling once it's finished at the anarchist bookfair (as well as by order, of course. It'll be available to all you lovely blog readers who are interested!). I started it a couple months ago, and have hardly written any more for it since, but I plan on changing that now that I have a deadline (the bookfair!). It'll cover all the basics, in a series of short chapters, so it'll really be like a short book on unschooling... This project is pretty exciting to me! Here's the thing: I'm not a very academic person. And by that I mean, quite simply, that I'm just not very into academics. I read this post recently, by a grown unschooler who states that "many grown homeschoolers are wide-ranging academics on the side, but most people are not. That’s a problem." I'm inclined to agree with him that many older and grown unschoolers seem to be pretty into academics, though that might just be my perception. Because there have definitely been times when I've felt a bit out of place, or really self-conscious at the very least, because of my lack of interest in more academic pursuits, when among, or in discussions online about, older unschoolers. It does sometimes seem like most unschoolers hit a certain age, and go all academic suddenly, and like maybe I just missed that. Was it supposed to happen? Am I lacking something? Will people think less of me?? So says my insecure self, though I know it's unlikely either that I'm missing anything or that people will think any less of me for it! I think one of the most important aspects of the unschooling philosophy is the realization that no one type of learning is more valuable than any other. There isn't a hierarchy of value, with the most academic subjects at the top, and the least academic at the bottom. And choosing to delve deeply into a subject is no better than choosing to look only briefly into it (the point should be sating your interest, however in-depth or not that interest turns out to be). Sure, sometimes I let insecurity creep in (well, okay, a lot of times), but I really do believe absolutely and completely that all learning has value. And that whatever I (or anyone else) decide to do with my time, be it studying biology, hiking, learning Latin, watching bugs crawl up stalks of grass, or (even!) playing video games, it all has value. Some of what I learned in my early childhood (when we were very relaxed homeschoolers), I remember clearly, involved at least some formal lessons or schoolbooks. There was a reading program I started, though when I decided I had no interest in continuing it, no one minded (my mother was always of the opinion that children will learn to read, without being taught, when they're ready too). Math definitely involved workbooks (until I hated it enough at 11 or so that I put a stop to it). But one thing I can say with absolute certainty: I have never had anything even close to a formal lesson on how to write. And I'm not talking handwriting here, but actual writing: the thing I'm doing right now to create this post. I like this fact, because I get to tell it to people who've read some of my stuff but are skeptical of unschooling, and watch the look of surprise and disbelief on their face. I feel like it's a good and simple way to prove my point (my point being that children can learn without being forced to, or even taught how). So, how did I learn to write? Well, actually, I suppose I was writing to some small extent before I could even read. Our house has always been full of books. There's at least one bookcase in every single room of our house, except for the bathroom (which has only a small pile of books instead of a whole bookcase!). The small library my family owns was collected over many years and from many different sources (book catalogs, stores, garage sales, library sales...). My parents are big into readers! Because of that, from the time I was in the womb, I was read to. And having always heard stories, as a young child I think it was fairly natural that I'd want to create some of my own stories as well. So I'd simply dictate them to my mother, who would very kindly write them down for me. Later, when I started reading myself, I jumped headlong into the world of fiction. I read countless novels: sometimes as much as three books in one day (people are sometimes skeptical when I tell them I've read thousands of books, but I always assure them that really, I have)! Historical fiction, teen contemporary fiction, mysteries, the supernatural... And of course, always fantasy. Where my interest in other genres has waxed and waned over time, fantasy has remained a constant (if you ever want good recommendations, just ask me. I'll happily geek out about fantasy novels anytime!). I love fiction, and have loved it for many years. The way whole stories, characters, places can become so very real in the pages of a book is just...incredible. I love reading stories. And when I try and think of how I actually did learn to write, that's really where I trace it all back to: all the reading I did (and do). Even being an unschooler and believing that children will learn naturally, I find myself marveling at how much I absorbed about the structure and rules of language simply from reading. It was never a struggle when I started writing more myself. I knew where commas went, how long was too long when it came to writing sentences, how to structure a paragraph, and similar intricacies of the written language. Obviously, I've improved a lot since then (and will continue to grow and improve), but from the time I really started writing in earnest I had a very strong grasp of how to write. I just needed practice. Even when it came to spelling, the closest to "formal" learning I ever did was play a game, for fun and by choice, with my sister, where my mother would say a word, and my sister and I would try and get the correct spelling first. Yes, both of us have always been writing/language nerds! I almost wish I could place an exact time and moment when I started really writing, the same way I can with reading (the whole Harry Potter spurring me to read on my own is an anecdote I've told many times), but really, I don't think there's any moment I can pinpoint. I learned to write from stories told or read to me over many years, then from reading dozens, hundreds of books myself. "We do not need to motivate children into learning by wheedling, bribing or bullying. We do not need to keep picking away at their minds to make sure they are learning. What we need to do, and all we need to do, is bring as much of the world as we can (to them); give children as much help and guidance as they ask for; listen respectfully when they feel like talking; and then get out of the way. We can trust them to do the rest." Sometimes, I wonder if it would have made what I have to say about school more credible if I was a dropout (rise-out, opt-out...) myself, instead of a lifelong unschooler. Because as such, it's assumed quite often that I must have no clue what I'm talking about. School doesn't really teach obedience to authority, conformity, and all that jazz. I just think it does, because I've never been to school to see how nice it is, and instead have been turned against this fine institution by my prejudiced parents. Or so the idea goes, at least. It's true that I can't ever know from personal experience what elementary or high school is like (besides kindergarten, of course), but I feel very confident making the statements I do about school. Why? Because all the research I've done shows not only that school really does teach obedience and conformity, but that the educators in the schooling system are well aware of that fact. Open any mainstream/used in university classes sociology or education text, and I can almost guarantee that it mentions something called "the hidden curriculum." "The fundamental patterns in any society are held together by tacit ideological assumptions. In schools, some rules are not overt, but they serve to organize and legitimate the activities of teachers and students. Much of what the school teaches and the students learn does not appear in the formal curriculum. Successful school performance requires that the student learn what are considered important and useful skills and knowledge. But students must also have the skills to uncover the hidden rules and expectations that affect their dispositions, identities, and personalities. For example, schools emphasize conformity, deferred gratification, achievement, competitiveness, and obedience to authority [emphasis is mine]. Students must understand the social and other dimensions of this hidden curriculum. The hidden curriculum refers to the tacit teaching of norms, values, and dispositions that occurs through student's social experiences in routine school activities." "...the school's so-called hidden curriculum, subtle presentations of political or cultural ideas, imparts important cultural values. School activities such as spelling bees and sports encourage competition and showcase success. Children also receive countless messages that their society's culture is both practically and morally good." Taught to think our culture is both "practically and morally good," is it any wonder that things continue to be so bad? If our culture is good, then there's obviously no need to change things in any real or radical way. The same book also goes on to say that "schools further socialize young people into culturally approved gender roles," something that, as a person who often chooses to identify as a feminist, and has a good handful of queer friends, disturbs me on multiple levels. I find it funny that so many people consider writers like John Taylor Gatto (who wrote, among many other things, this essay, which I think is great) to be so shocking, considering he's really just framing what the education profession knows to be true in a different light. Grown Unschooler Tara Wagner: "Amazing things happen inside of freedom." This is the latest in an ongoing series of interviews with grown unschoolers. Read more here! Are you a grown unschooler yourself? If so, I invite you to participate in this project. 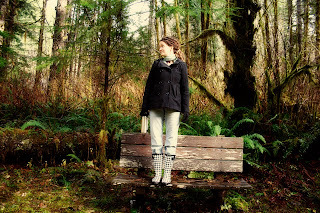 And now, I'm very happy to introduce Tara, someone who's blog and photography I've long admired. Tara Wagner is a mother and a lover, a writer and an organic life coach, specializing in life learning, organic parenting and authentic living. 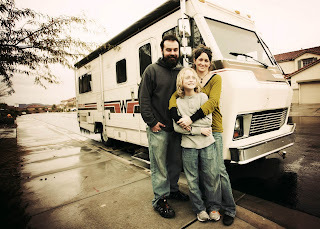 She currently travels the US with her husband and son in a truck converted to run on veggie oil and a solar-powered RV. 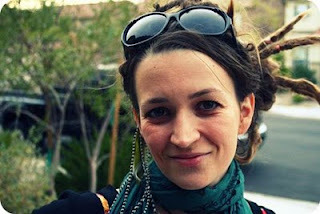 You can find her blogging at TheOrganicSister.com and SustainableBabySteps.com. I "officially" left school about half way through 9th grade, but mentally I had begun checking out a few years before. How long have you unschooled/did you unschool? I was out of school for the rest of what would have been my high school years. Instead of college, I chose massage school and self-education for entrepreneurship from there. My mom didn't choose it but she supported my choice under the belief that "school is not for everyone" and with the ideal that I can create my own success. I had enjoyed school and schoolwork until about 7th grade. But changing schools had confused the administration and they began putting me in classes I had already taken. I got incredibly bored and was no longer challenged or having fun. I was also not meshing with the dramatic high school "scene" and felt most comfortable around adults. My transition out of school started with me skipping classes, and only attending the ones I enjoyed or was challenged by (this was where my interest in science and computers began). They tend to frown upon selective attendance, so they suspended me. I think I asked my mom if I could be homeschooled, but there was never any thought of doing school at home. We had never heard of unschooling and didn't tap into any homeschooling communities. As such I think many people looked at me as a "dropout" although I never felt like one. I felt very strongly that I was opting out, and with my mom's support, I felt empowered by that. I think the biggest challenge I faced was in overcoming the mentality of my peers. Since we never got involved with other homeschoolers and had never heard of unschooling, I was still spending my time with the same friends and mentally still involved in the same high school drama. My views were limited by their views and didn't expand until years later when I started to seek out new information or ideas and ways to live. Since I've come to see unschooling as a way in which we live, ultimately I think I was deschooling through high school. I made a lot of unhealthy choices in an effort to regain my autonomy and the experiences gave me a lot of contrast, showing me what I no longer wanted to have as part of my life. Just one? I guess I'd say it comes down to the freedom: the freedom to create your own life, to heal, to grow unhindered, to explore without imposed limitations. Amazing things happen inside of freedom. I think going against the norm and doing so without support can be especially challenging. If a person lives in an area without a local unschooling community they might be more susceptible to criticism or pressure to fall in line with the rest of society's ways of thinking. I didn't have the need for college for the work I wanted to do at the time (massage therapy) so I chose massage school instead. I later opened my own business without a business degree or any real training and quickly came to feel as though most of what I might spend tens of thousands of dollars on in college would be a waste of time when I could learn it myself. Especially in this day and age of open-source learning and the endless resources available to us, college is only one way of obtaining it. That's not to say that I won't at some point decide to take courses. But I don't feel the need for a degree for the things I want to be doing in my life. I don't and have never seen the need for someone else to approve of what I know or can do and unless I someday decide to be a doctor, I don't see that changing. As a teen I had several entry-level positions as a cashier or office assistant. I didn't last long because I didn't enjoy the job or the money I was making and wanted something more for myself. Once I knew I didn't need high school like I was told I did, I soon came to realize I don't need anything else that doesn't work for me, either. Now I'm an entrepreneur: I'm a writer and blogger, photographer, unschooling coach, massage therapist, and freelancer. I do the things that bring me passion and don't feel as though I need to or should choose one field. The world is too big and there is too much to do to pick just one passion. Most definitely. I love what I do and I'm sure it will change and evolve as I do. Not really, not the way I view unschooling. I don't think "unschooling" created me or gave me an ability. I think it simply gave me the freedom to create myself and supported my innate abilities. Whereas schooling or limited mentalities got in my way, unschooling stays out of my way. Yes. I don't feel as though I "have to" be tied down to something I don't enjoy. I don't feel as though I should settle or "be grateful" just because. And I desire a lot of creative freedom. I haven't worked for someone else in about ten years and I would have a very difficult time doing it again without that creative freedom and autonomy. A huge one. It's impacted every facet of my life, from my relationship with my spouse, to my parenting, and life's work, to my outlook on politics and health and social issues. I base everything off of freedom, support of the whole person and living without conditions or fears. Ultimately, I don't think I would, although I do wonder what would have been different had I left school earlier or connected with the broader world outside of school after I left. But I do think that my experiences shaped me and that the contrast helped me grow. Yes, although we came to it late. But my foundation helped me to embrace it quickly. Soon after we withdrew him, I began to trust not only my intuition around learning (free schools have always appealed to me) but also my child's natural instincts and passions. Trust your instincts. Try new things. Get connected with new people. Put yourself out there. Take your time. Hurry up. Life is full of so many opportunities, most of them hidden and requiring your passionate pursuit of them. The same advice I'd give to anyone making any decision. College is one route. It doesn't negate or guarantee any other route. Trust your instinct. Go after what you want. And don't fall into the trap of listening to other people's fears. Or your own, for that matter. Slow down, and spend a lot more time on building connection and trust than anything else. Then start building upon interests, inviting new things and people into your lives, and creating a rich environment in which the whole family will thrive. Don't get wrapped up in the fears of others and don't project your own fears or beliefs or desires on your kids. Don't let a label define you. 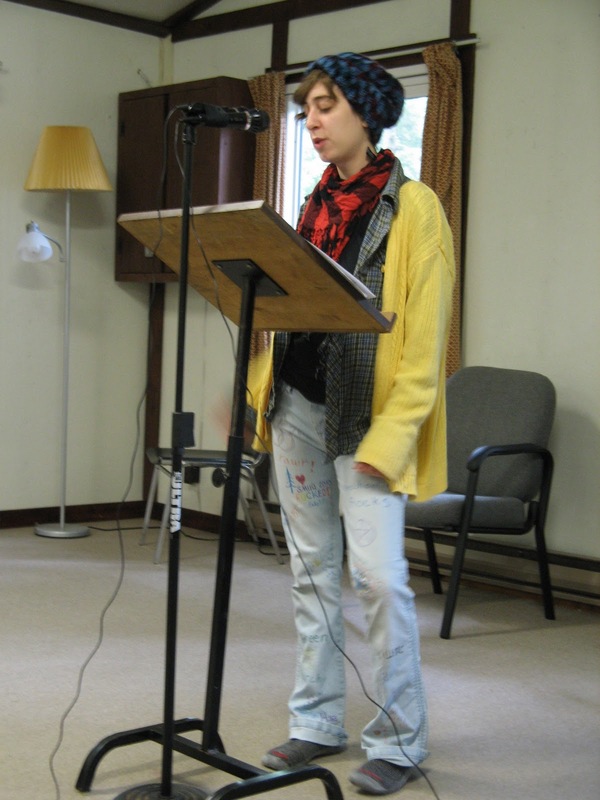 The unschooling label can be freeing...or it can be binding. Instead of embracing a label, embrace the way you and others want to feel - joyful, connected, adventurous? Focus on those things and let freedom, trust and compassion be your cornerstones.